Fox News reported that because of China’s the birth is extremely unusual in the country because of the country’s one child policy. She gave birth after the death of her only child. Clinics and countries throughout the world impose limits on IVF treatment. The treatment is less effective with age. Such treatments also cause concerns for the welfare of children who are born after the treatment. Sheng Hailin, is now 63. She lost her first daughter after an accidental gas poisoning case in 2009, according to the China Herald. “To survive and free myself of the loneliness, I decided to have another child in my old age,” the newspaper quoted Hailin as saying. The Daily Mail reported she and her husband gave birth to survive and be “free from loneliness.” Because of the births, Mrs. Hailin has not been able to retire and instead has had to increase her work schedule. She said she is sorry she is not able to spend as much time with her children as she would like. 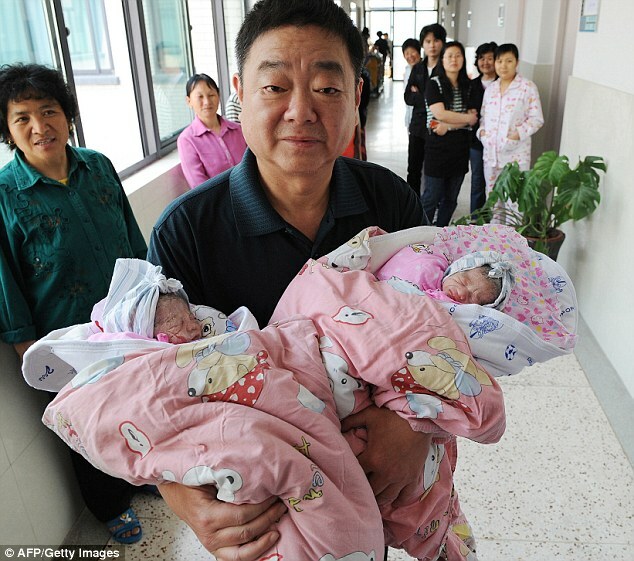 “‘For the baby girls, I have given out all I have,” she explained to the China Daily. The Chinese government in November granted couples the right to have children if one parent is an only child. According to an estimate, one million families in the country have lost their sole descendant after the beginning of the one child policy in the late 1970s. Another estimate calculates that four to seven million more are expected to do so in the next thirty years.